The Omni Bead Ruptor 12 is part of the newest generation of bead mill homogenizers. This economical system is specifically designed for grinding, lysing and homogenization of up to 16 biological samples prior to any molecular extractions. Using disposable sample tubes pre-filled with a variety of lysing beads, the Bead Ruptor 12 vigorously and uniformly shakes the tubes providing an efficient, consistent, high-yield and quality homogenization usually in less than 30 seconds. 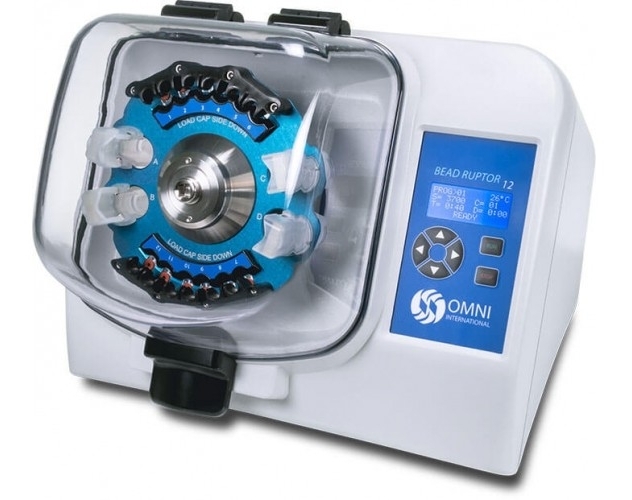 The Omni Bead Ruptor 12 is an ideal solution for releasing DNA, RNA, proteins, and enzymes from very tough and small samples while still retaining molecular integrity. Includes a tube carriage for 12 x 2/0,5 ml and 4 x 7 ml tubes. Interested in this device? Write an eMail to info@biovendis.de.